I’m really excited to sit down and talk with Jack Park, Certified Speaking Professional, Corporate Advisor, Football Radio Commentator and Best Selling Author. He has some powerful thoughts about what makes a good leader, plus a bunch of fun stories about football history. Jack formed the business Financial Insights more than 20 years, which does leadership training for corporations and associations across the country. For the past 38 years, he has been a radio commentator for Ohio State Football, with weekly and daily segments when the Buckeyes are in season. Woody Hayes – What we can learn from Coach Hayes is that you will get to a place in life where you can look back and say, “Gee, I’ve been able to accomplish a fair amount, and I’d sure like to thank those people that helped me get where I am. While you can’t always thank the people that helped you, you can pay it forward. Urban Meyer – “Urban is basically the organization man … A lot of coaches have plans, Urban has a system.” He has an excellent system, he’s an excellent recruiter, and he surrounds himself with tremendously talented people. Bo Schembechler – “Bo really put a high priority on the people. Now other coaches do too, but I don’t think anybody ever did it any better than Bo.” There is a story from Michigan State alumni that, if any player ever came to his office unannounced, his secretary was to make sure they didn’t leave until Bo could speak to them. Bo recognized early on that the business he was in was not the football business, but the people business. It took Lombardi 20 years to find a head coaching position, and at one point it was estimated he got turned down 22 times. “He had confidence in himself when other people apparently didn’t,” but he wasn’t arrogant. He continued to hone his craft. Lombardi was successful because he was a hard worker with a dedication to excellence. Between 1959 and 1967, Lombardi led 5 NFL championship victories, in addition to the first two Super Bowls victories, as head coach of the Green Bay Packers. I really enjoyed sitting down with Jack and talking to him today. He’s always a delight to be around, and he has collected a lot of wisdom that he is more than happy to share. Click here to Download the Transcript PDF. 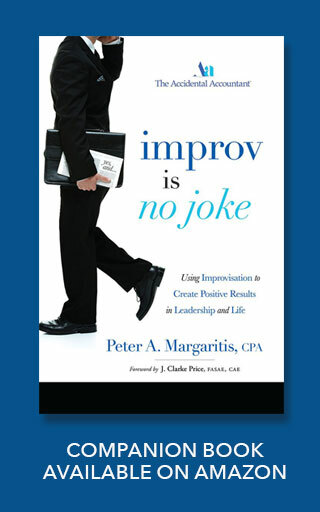 Peter: Also, if you’re not signed up for the SN challenge, please go to my website PeterMargaritis.com and scroll down to the SN challenge call to action and click to register to begin building the effective habit of “yes and,” and the principles of improvisation. And remember to share your experiences on Twitter using the hashtag #yesandchallenge or on the Accidental Accountant Facebook page. Now, if you’re not sure what the SN challenge is all about, please go back and listen to episode 0. This is where we discuss the SN challenge in more detail. This week I’d like to share with you an article in Fast Company titled, Yes, And… Improv Techniques to Make You a Better Boss by Lindsay Levine. Lindsay is interviewing Charna Halpern, co-founder of iO, formerly known as Improv Olympics, a Chicago and Los Angeles-based theater and training center that launched the careers of comedians like Tina Fey, Amy Poehler and Mike Myers. She says, “business leaders can benefit from incorporating improvisation techniques into their leadership style.” Halpern says iO emphasizes a high-level communication and collaboration. 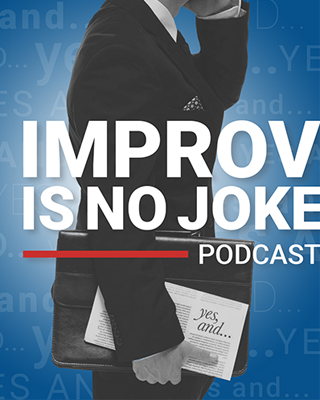 She goes on to state that, “Improv is based on soft skills such as listening and communicating. Listening is crucial because you need to be present and in the moment, Halpern says. ‘Most people are waiting to speak and not listening in the moment. Instead, they’re thinking of what they’re going to say,’ she says. In improv, you must listen to what’s been said and pay attention so you can react appropriately. If you’re not focused on what’s happening around you, you miss an opportunity to build the scene, and the show comes to a screeching halt,” and Charna is spot-on. But then again, of course she is. Hello, Captain Obvious! I’ll put a link to this article in the show notes. Okay, it appears that I’ve completed my to-do list, so without further ado, let’s get to the interview with Jack Park. Peter: Welcome everybody, I’m really excited that today I am actually in the home of Jack Park. First and foremost, Jack, thank you so very much for, one, letting me in the door. Jack: Peter, glad you’re here today. You’re welcome. Peter: And thank you and thank you for taking time out of. I know you have a very busy schedule, a little lighter maybe in the summer now that Ohio State’s not playing, but thank you anyhow. Greatly appreciate you taking the time to spend with me on my podcast today. Jack: Happy to do it and I feel privileged. Peter: Oh thank you. Wow, I’m glad we’re reporting this. I’m gonna keep my for posterity purposes. I know everybody heard a little bit about your bio in the lead in, but tell us a little bit about yourself, because you’re a very, very interesting individual. Jack: Well, I’m a CPA to start with, by profession. I never practiced public accounting. I was in industry several years, and then I formed my own business, more than 20 years ago now, called Financial Insights, and I basically do leadership training for corporations and associations across the country. I have done a lot of leadership training for state CPA societies, institutes and associations. As you of course you do, and we work together of course in doing some of that. And I like the corporate work, basically going in to do leadership training for them. I’ve also been a radio commentator for Ohio State football. It’s a very small piece of the Ohio State football radio work, but I do a segment every Saturday, and I do a daily commentary on Ohio State football called the Buckeye Flashback. The 2016 season will be will be my 38th year as a regular commentator for sports radio 97.1 The Fan. We’re the flagship station of the Ohio State football radio network, and it’s something I never really started out to do, but it just kind of happened. And from there I’ve written some Ohio State football books, and it’s become a big part of my speaking business. And so a few years ago, actually it’s been probably more than 10 years ago now since I decided to marry the two, so to speak, and I created this leadership program called, “The Leadership Secrets of Football’s Master Coaches.” It’s basically a leadership program, it’s not a football program, but it’s how to develop leadership within the Association, within the organization, based upon what made the greatest football coaches of all time so successful. And almost without exception, the great coaches were great coaches because they were even greater leaders than they were coaches. So basically that’s what i’ve been doing over the years. It’s a program that basically never stops growing. There’s always something else to be doing. It’s always a work in progress, and I always find it very invigorating, and and that’s still what I’m doing today. Peter: I think the audience would want to know: how did you fall into the radio job? You said it just kinda came up or what happened, how did that happen? Jack: Well I met a man named John Gordon, who was that time with sports director of what at that time was known as WBNS Radio, and of course those are still our call letters. Today we’re known as 97.1 The Fan. Actually we’re an ESPN station, sports radio 97.1 The Fan, and John asked me to come in and be on a new sports talk show, 38 years ago, and he said she seemed to have some interest in Ohio State Football. And this was in September, just as we’re starting the football season. It was kind of interesting, at that time the station carried the Columbus Clippers AAA franchise. At that time they were franchise of the New York Yankees. Peter: Wow that’s… if it hadn’t… you had to have pondered that at times over the past thirty some odd years. Peter: Where did you gain your Ohio State football knowledge prior to that? I mean you’re an encyclopedia as it relates to Ohio State football. Jack: I grew up in this area. I grew up in a small town right outside of here, New Lexington. I never played any sports beyond high school. I played high school football and basketball. I went to undergraduate school here at Ohio State, but as a kid growing up I had a tremendous interest in Ohio State football. It’s just something that I was attracted to. I was very fortunate as a kid. My dad, mom and I went to the games and so I got to see a lot of the games. Hopalong Cassidy was my childhood hero of course, as he was for everybody back at that time and so forth there. And then I went to graduate school to University of Pittsburgh, and joined the Westinghouse in the corporate world. A couple years later, Westinghouse transferred me, of all places, back to Columbus, Ohio, where I had gone to undergraduate school. That was one of those coincidences, you might say. I changed jobs a couple times before starting the consulting and leadership development business, but it’s just kind of funny the way things kind of worked out, you might say. Peter: Man, that’s a great story, and the the other part that fascinates me is, one, you’re a CPA. You’re very financially astute. You wrote a class on How to Identify, Explain, and Present Pertinent Financial Information to Non-Accountants, which a lot of people think, “Well, that’s like a really technical course,” and I’m going no it’s more of a communication type of course that you wrote. Jack: Absolutely. Yeah, and you do a very good job of presenting that for us, and we appreciate that. You’re doing a great job. Peter: Thank you very much. That’s two “good boys” I got on this thing that I gotta go for three now. I’ve heard you speak a number of times, and most recently put out of Audubon University for the Ross Leadership School, and you did your your football coaching leadership presentation. What’s the title of that again? Jack: It’s The Leadership Secrets of Football’s Master Coaches, and the one coach I used probably more than anybody else is Vince Lombardi. Lombardi was one of the greatest leaders of all time, a very self-made guy and very confident. Lombardi, in my opinion, could have done many, many things in life and have been extremely successful, and he chose football. He played college football at Fordham, and in my opinion he became the greatest coach. He left a lot behind. He left his leadership model, and he left a lot documented. His son has documented all that in books and everything, and thank goodness there, because he left he left a lot for the rest of us to really understand what helped him become such a great coach. Peter: And quick, please correct me if I’m wrong, but isn’t there an Ohio connection to Lombardi somewhere? In how he got to be the Green Bay Packer’s coach? Jack: Yeah, it’s interesting. I would say maybe the greatest coach in college football was Knute Rockne, because he was such a creative guy. He really knew football. He played football at Notre Dame. Rockne also had a personality that really helped expand football across this country. Rockne was basically the Henry Ford of the automotive industry. He was Andrew Carnegie of the steel industry. I call him the Father of American Football. Now here’s an interesting thing if you live in Ohio: A lot of people don’t know this. He became head coach at Notre Dame in 1918. Notre Dame’s first game that year, which would be the first game ever coached by Knute Rockne at Notre Dame, was played in Cleveland, Ohio. It was played at the Van Horn Field on the campus of Case Institute of Technology, which is now Case Western Reserve. Jack: I have walked that field. It’s basically empty now. It’s a beautiful field used for intramurals, but the stadium and everything is all gone now. But an interesting thing happened that day. The date was September 28, 1918. Notre Dame won the game 26-6. The second and third Notre Dame touchdowns that afternoon were scored by George Gipp. Most people know the “win one for the gipper” story and Ronald Reagan and all this, and George Gipp. A lot of people don’t know is that this guy even played at Notre Dame, let alone scored the first touchdown, but the first touchdown ever scored for a Knute Rockne coached football team at Notre Dame was scored by Curly Lambeau, and THE Curly Lambeau. Jack: After Notre Dame, Curly Lambeau would go back to his hometown of Green Bay, Wisconsin, then take a job with the Indian Packing Company. Curly is a pretty ambitious guy, and after he was a little while he persuaded the leadership, the ownership of the Indian Packing Company, to appropriate $500, so that they could start a semi-pro football team to compete with some of the other semi-pro football teams throughout the state of Wisconsin. Well Curly has has been gone for 51 years now, he died in 1965, but Curly’s team still plays today. In fact, they play at Lambeau Field, and of course we all know that team today is the Green Bay Packers. Now, Curly was a very ambitious guy. He also coached Green Bay East High School, and they won the state championship in Wisconsin in 1920. He had an excellent, excellent halfback there that he encouraged to go to Notre Dame, Rockne wanted him. This kid ended up on the Notre Dame campus in the Fall of 1921. In 1924, he is the starting left halfback, in probably the most glorified backfield of all time: the Four Horsemen of Notre Dame. His name is Jim Crowley. Crowley is really inspired by Rockne, and he’s been inspired by Lambeau. He decides to go into coaching, and he ends up as head coach at Michigan State from 1928 to 1932. A better job at that time was Fordham University – Football has obviously changed since that time. Jack: He leaves Michigan State to go to Fordham, and there they compete for the national title every year. They don’t quite win the national title, but he has tremendously talented teams there. They win about seventy-six percent of the games he coached there, and one of his players is a kid that I say basically grew up on the streets of Brooklyn, and is educated in the South Bronx. He’ll play right guard on that offensive line known as the Seven Blocks of Granite, and his name was Vince Lombardi. Peter: I love that story. I’ve heard you tell a couple of times and I’m still amazed at your photographic memory, and the ability to remember that much detail and dates, and it was a Thursday and stuff like that. That’s always fascinated me about you. You said that Lombardi is one of your favorite coaches out there. What’s the one leadership attribute that you admire from Lombardi? Jack: So there’s several. Maybe his biggest strength, Peter, was his persistence. It took him 20 years to get a head coaching position. He got turned down for head coaching positions, and at one time it was estimated he got turned down 22 times, and he was a great assistant coach. He also, then, when he was an assistant and kept trying to get the head coaching positions, he still continued to build his craft, so to speak, and he was mentored by Red Blake at Army from 1949 through 1953. Red Blake, a lot of younger fans today may not remember that name, but Red Blake is basically the Urban Meyer or the Nick Saban of college football, back in the 1940s and 50s. He had I think four national championship teams at Army. Colonel Blake actually grew up in Dayton, Ohio, and started his college at Miami of Ohio, but then he went into World War I, and so he ended up graduating from West Point and became a football coach. He ended up going back to West Point several years later as their head coach. He was one of the greatest coaches of all time, and Lombardi was extremely fortunate to spend five years under him. He learned so much under him and then he went to the New York Giants, basically right as a man named Jim Lee Howell had taken over as head coach the New York Giants and completely surprised everybody. Nobody ever heard very much of Jim Lee Howell. He’d been head coach of Wagner College over on Staten Island. He’d actually played for the Giants as an end, but nobody thought of him much as a head coach. What Howell did was basically revolutionize football. It had been done maybe a little bit, to some extent, but not to the extent that Jim Lee Howell did. He hired two coaches: one to run the offense and one to run the defense. Now he had other assistant coaches too, but he basically put one coach in charge of the offense and one coach in charge of the defense. Today we call those offensive and defensive coordinators. I don’t know what title was used back at that time, but it really doesn’t make any difference. But the interesting thing about Jim Lee Howell, he hired two unknown guys at the time to run the offensive and defensive. The offensive coordinator was a young man named Vince Lombardi, and his defensive coordinator was a young man in his first coaching position ever, by the name of Tom Landry. They of course would go on to become two of the greatest professional coaches of all time. So he’d learned an awful lot from these people, and he was persistent. He was 46 years old before he had a chance to become a head coach, and he never played professional football either, so it was quite it was quite something for him to do this. Peter: I listen to that story, and I’ve heard that story a number of times. We can equate it to today, that some of the great leaders that we have are very persistent. I also hear you say that Lombardi listened. Jack: They learned from everybody, yeah. Yup yup yup. Peter: You also told me a story about Vince: he was a very religious man. Jack: Very much, yeah. Actually, when he was high school-age growing up, in what was known as the Sheepshead Bay section of Brooklyn, New York. That’s right down on the waterfront, not very far from… I’ve walked through that area. I’ve gone in there. I’ve taken pictures to the home he grew up in, and just want to get a feel for the area. This is obviously years and years later, he was born in 1913, but when he became high school age, he actually decided to study for the priesthood, and he went to a school there in Brooklyn run by the Catholic Diocese of Brooklyn, for young Catholic boys who wanted to be priests, by the name of Cathedral Prep. And for reasons that he never talked about very much later in life, he came within one year of finishing that, and for whatever reason he decided that maybe the priesthood was not his calling. Jack: So he plays one year of high school football. He’s a very, very strong guy, he played a lot of sandlot sports, but his ambition was to go to college. He was the oldest of five children, and his mother and dad never finished high school, and so his ambition was to go to college. Through playing one year of football at St. Francis, he was good enough to earn a football scholarship to Fordham University. I think at that early age, we could also see he was a little bit of a visionary. He wasn’t sure what he was going to do, but getting back to your point on religion, even though he didn’t follow up and become a priest, he went to church every day of his life. The players on those Packer teams could tell you: Basically, he would get up in the morning and he would go to St. Willebrord Catholic Church there in Green Bay, and attend the service there on his way to the office. You know, any time of the year. Jack: When the team was on the road, he knew where the closest Catholic Church was in every one of those cities. He would get up early and go to church that morning, and then come back to the hotel and join the team and go play the football game, and he was not a man that wore that on his sleeve. A lot of people didn’t know too much about him. That was a very private thing, but he is one of the most religious people that ever walked this Earth. Peter: Wow, I bet a lot of people in my audience are listening to that going, “Wow, I never even knew that. Never had any idea.” When I’ve sat through your your leadership course, especially this last time at Audubon University, you kind of wrap it all up, and I believe you wrap it up by talking about five different coaches. Who are those five different coaches? Jack: Well the first coach I talk about is, and you’ll be surprised when I talk about this one being an Ohio State guy. I talked about Woody Hayes, can you believe that? Peter: I’m shocked. Oh, stop the presses. Let’s rewind. Jack: There’s a lot you can learn from any of these coaches. I picked five, and it’s tough to bring it to five, but the thing that I think is the most important thing, as a business person wanting to continue to expand their leadership skills, or anybody in life, basically, what we can learn from Coach Hayes is: you will get to a place in life where you can look back and say, “Gee, I’ve been able to accomplish a fair amount,” (maybe), “I’d sure like to thank those people that helped me get where I am.” and you know what? A lot of them are gone now, and you can’t do that. He found himself in life that way. We’d love to go back and thank maybe that third grade teacher, that high school football coach, that Sunday school teacher, or that neighbor across the street that did all these things for you. So he said, “Hey, you know I can’t pay those guys back. In fact, I can’t even thank them. But I can pay forward to the next generation,” and that was basically the whole theme. You get down to my office, you’ve seen that. You see that big poster of Woody, and it says, “Pay it forward.” I look at that every morning as I go to work: pay it forward. That’s what we really doing the business world. Nobody’s gonna buy our products and services unless it’s going to help them become better into the future, and I think basically that’s what a successful business does: it pays forward to that next generation. The second guy we’ve talked about in the course is Knute Rockne. Jack: [laughs] Yeah, another shocker. I have seen, and you’ve seen, and everybody listening to this podcast I’m sure has seen organizations that tried to do too many things. Tried to be everything to everybody. Jack: When Vince Lombardi went into Green Bay, they had a playbook that was = tremendously big, and they had every play imaginable in that playbook, and they weren’t very good at executing any of them. His basic philosophy of running a football team was: we’re going to decide what we can do best and then we’re going to work on that to be maybe the best ever that’s done that, at the exclusion of everything else. So you can’t be everything to everybody. So he picked basically a very strong running offensive, which became known as a Packer sweep, and later became known as the Lombardi sweep. He basically supplemented that with some really good passing patterns. Jack: But they didn’t have a huge offense in terms of number of plays. They had a basic offence, and there were variations of them, but we’re going to do only what we can do best, and we’re going to exclude everything else, and then we’re going to work on becoming the best that we can be there. You can think a lot of companies there that have too many products and many services. You know, there’s an ice cream store up here that I love to go to rather than Baskin-Robbins. How many do they have, 31 flavors or 51 flavors? Jack: This Tom’s ice cream here has six flavors. I like that. Just decide what I want to do, you know what I mean? Jack: Graeter’s is pretty good too. Jack: Yeah. Urban is basically the organization man. Jack: Everything fits together in a big organization. A lot of coaches have plans, Urban has a system. You just reload the system. But there’s plans laid out within that system for everything imaginable, all the way down to the nutrition and looking ahead to the Sophomores that are in high school that won’t be coming into college for another three years, and doing everything and laying everything out. I mean, basically, it’s got an excellent system. He’s an excellent recruiter, and he surrounds himself with tremendously talented people, and that’s what he makes it go. He is truly the organization man, and you got to have one of those to lay it out and see the future. The fifth guy is man by the name of Bo Schembechler, from the University of Michigan. Bo grew up in Barberton, Ohio. He is a graduate of Miami of Ohio, and he was also an assistant coach at Ohio State, under Woody Hayes for five years. In fact, Woody was was his college coach at Miami of Ohio. That was in 1949 and 1950. Who would ever guess that those two would become such fierce competitors, starting in 1969 when Bo took the head coaching job at the University of Michigan, of all places, and of course that was Woody’s real nemesis. When he came in there, he said, “We’ve got to beat Michigan,” and he did a pretty good job of it. Jack: And so forth there. I didn’t know Bo really – I interviewed him once, and I’ve gotten to know his son pretty well, Shemmy Schembechler, that lives just about five miles from me. I mean, who would ever thought that Bo Schembechler’s son would live about five miles from Ohio Stadium? Jack: But he does. His wife is from Columbus, and they love being here in Columbus. Bo really put a high priority on the people. Now other coaches do too, but I don’t think anybody ever did any better than Bo. His players were his number one priority. I’ve gotten this second and third-hand from a lot of people I know up in Michigan, and I’ve spoken in Michigan a lot. You have a pretty thick skin if you’re a Ohio State guy, to speak at corporations and associations up in the state of Michigan, but we have a lot of fun doing it. Jack: “So you don’t let him get out of this office, and you get me in there, and I don’t care if I’m in a meeting with the president of the University of Michigan, I will leave that meeting with the president of the University of Michigan and come in and see what my player needs that I can help him with.” And there was something about the way he put players first that many of the Michigan guys I’ve interviewed over the years that played there – guys like John Wangler, the great quarterback around 1988 that played there. I mean, they respect him just like the Ohio State players have respected Woody Hayes, but Bo was a guy that put people first, and I think in any organization that’s one of the things that you have to do. Peter: Because Bo recognized early on that the business that he was in wasn’t the football business. The business he was in was the people business. Jack: Jim is jokingly supposed to have said to a sport writer one day, “Well, you know what I do? I make sure Vince has everything he needs to run the offense. I make sure Tom has everything he needs to run the defense. And me, I make sure all the footballs are blown up so we can play those football games on Sunday afternoons.” Now, that’s a little bit of embellishment Peter, but it does show that, basically, he put tremendous amount of power in those two guys to run their part of the program. Peter: Right. He trusted them immensely to be able to do that, but he also provided them with the tools they needed to become successful at what they were doing. Jack: And they had great players. They had great players back at that time. A guy by the name of Frank Gifford wasn’t too bad. Peter: He wasn’t too bad, yeah, I’ve heard of him before. [laughs] Of the five, I have to think that I know which one you would rate number one of the five, if you have if you had to rank them, but I’ll keep that one to myself, and ask you the question: of the five that you talked about, which one you rank on top? Jack: And there’s about three or four reasons there. First of all, it took him 20 years to get a head coaching position. He had confidence in himself, when other people apparently didn’t. I know Lombardi was never an arrogant guy, but he really had good self-confidence. There’s a big difference between arrogance and confidence. Jack: And he had that confidence. And while he was continuing to work toward getting that first head coaching position, he continued to hone his craft, he continued to get better and better and better. Going to Fordham University was a great thing for him, coming right out of high school. Basically Fordham is a Jesuit institution, and its really been founded on the the the philosophy that people can really better themselves through hard work and dedication to excellence – and those two characteristics I think fitted him perfectly. He was a hard worker. It just opened up a whole new world to him when he went to college out of Sheepshead Bay, there in that section of Brooklyn, and so he really struggled getting that first head coaching position. But he stuck with it, then when he got there, there was far more talent in Green Bay than anybody realized. What they lack was leadership at the top. They did not have a real coach there before he got there, and so the town basically was going to waste. Jack: And that turned over a hurry. Lombardi did not make a lot of wholesale changes in the players. Sometimes you do. Jack: Coaches go in and get rid of the players, they bring in other players, and all this, and basically he took the players that had won one game this season before, and eventually turned them into world champions. Peter: And if I remember the story correctly, and I think it equated to, “Let’s do what we do best,” and as you’re describing it I’m thinking about when I was in corporate America, at the performance review. Peter: And in performance review, usually at the end you had goals. Peter: and I may write down maybe four goals that I could accomplish this year, and and my boss would write maybe five more on top of that. I don’t know two people that can accomplish nine, ten goals, and successfully execute, versus here’s your top three. Sounds like a balanced scorecard method, as you would described it. Jack: Yeah, yeah, yeah. If you have eight or ten, maybe that’s a little bit better for somebody coming right out of college, who’s gonna get a lot of things done, but they’re not overly huge goals. As the years go along, you’re better to have two or three, and and make them worthwhile. Peter: And make them worthwhile. So, let’s talk a little Ohio State football. You’ve been to a game or two? Jack: A few. Just a few, yeah. Peter: Have you ever attended the Ohio State-Michigan game at all? Jack: Just a few of those too. Peter: How many? And you’ve attended them here in Columbus as well as that state up north? Jack: Yeah. I really don’t go up to the state up north anymore. I mean, you know, I’m on the pregame show, radio-wise. We do that locally here, and then I usually watch it on television when it’s up there. I have not missed a Michigan game here at home. The last one I missed would have been 1952. Jack: Something there. So, I started out very, very, very young as kid, about this tall. Hopalong Cassidy was my childhood hero at the time. Jack: But Peter, I think I’ve gone to 14 games up there over the years. A couple times my work schedule was such that I couldn’t go. I actually remember, I think one game in 1977 I had tickets and and one of my friends used them because I had a work schedule and was coming back from somewhere Saturday morning, and doing that and everything. I love the Michigan game. When I was little bit younger, I never thought I would say what I’m now going to say, and I still love being at the games much more than watching them on television, in terms of the entire experience, but… you see football today better in your living room, or in your rec room, than you do in the stadium, because of technology. Jack: And all the replays and everything like that. I really see the plays better, and I think most football fans do when you watch it at home, and the big screens now are so great. So that’s probably had a little bit to do with it, too. Never miss a home game. Never miss a home game. Peter: You’ve never missed a home game, okay. It’s funny you should say that because, you know, I graduated from University of Kentucky, so big basketball guy. Peter: And this year I had tickets to the final four in Houston. Jack: I know you did, yeah. Peter: And we were sitting somewhere up in the rafters away, but that the big screen we could see, and it was a really exciting championship game, by far, Villanova hitting that shot right at the end. Peter: But then as I reflected back, one I think the game goes by quicker in attendance because you don’t see the commercials and stuff. It seems like the game was started and was over so quickly, but where’s the replays? Peter: And I actually missed the commentators. Final Four next year is out in Phoenix, Arizona, and I’ve been putting in my application for over twenty plus years. I have not put my application for this next year, and I think, to your point, that I’ll probably take a few years off and just be able to watch it at home. Jack: I don’t think anybody will ever see a better game than you saw this year with Villanova. That’s maybe the greatest college tournament game of all time, would you say? Peter: That was one of them. Peter: Yeah, and the other final four I attended, the game was was in a last second shot. It was in New Orleans, I forget the year, Syracuse was playing Indiana, and Keith Smart hit a shot from the corner to beat Syracuse. I still remember that, and I’ve been to a couple other Final Fours. I have been to Indiana, where I saw Kentucky play Arizona. They lost in overtime, but yeah that Villanova game, and being a Kentucky fan, I just said through the weekend: I just need to remember my ABC’s. ABC’s: Anybody But Carolina. Jack: [laughs] Right, okay. Right. Peter: Yeah, the Carolina folks I have told that to are say they have the ABK’s: Anybody But Kentucky. Jack: [laughs] Yeah, yeah, yeah. Peter: What was what was your favorite Ohio State-Michigan game? Jack: Jim Tressel second year was pretty good, and his first year was also pretty good. You may remember, when Jim was hired, basically the press conference was Wednesday, January 18, 2001. By chance, Ohio State is playing a home basketball game that night against the University of Michigan. Jack: Now how many times has that happened? He’s introduced at halftime of the basketball game. Of course, he comes out and speaks to the crowd for just a minute or so. Something like that. When he addressed at Ohio State basketball crowd that night, he says you’ll be proud of our young people in the community, in the classroom, and most especially in 310 days in Ann Arbor, Michigan. Well, we went up there to Ann Arbor, Michigan, 310 days later as huge underdogs. Jack: And we ended up beat them 26 to 20. Now the game didn’t have anything to do with the Big Ten title or anything like that. Jack: Because basically, we would end up seven and five in his first season. But there was something about that game that I’ll never forget. It was 23 to nothing at the half, and we held on and we had some injuries in the second half, and Craig Krenzel started his very first game ever as quarterback for Ohio State. The interesting thing was that Craig had grown up in the Detroit area. That was a great Michigan game, in terms of just the love for Jim Tressel. Of course the second one was the one that put us into the national championship game. We beat Michigan 14-9, and that game came down to the last second. Michigan had the ball right around the Ohio State 20-yard line with one second to go, and a pass into the end zone was intercepted, then that saved the game. Basically it won the game 14-9. Peter: Wow. Jack: And that was typical of what happened that year. So many of those games in 2002 went right down to the last play, and of course we won the national championship over Miami in double overtime. Jack: A lot of close games in 2002. Peter: Was the Purdue game in 2002, with the the catch touchdown, because we were behind most of the time? Jack: Yes, Yeah, it was called Holy Buckeye. And Ohio State played its very first overtime game ever in history out at Illinois that year, and we had to basically beat Illinois in overtime to put us in a position where we then could beat Michigan, to get the bid to go to what, at that time, was called the BCS, to play Miami. They were a huge favorite over us, and they were defending national champions. I think they had won 31 games in a row, and a lot of people told us that we had no business being in that game, and that you’re gonna really get embarrassed out there, and of course we were able to win in double overtime. Peter: You have written how many books on Ohio State? Jack: Well, four. Basically it’s three-and-a-half or four, however you want to count them. Jack: Our first book came out, called Ohio State Football… The Great Tradition, and it’s basically a chapter on each of the series Ohio State has against each of the other Big Ten opponents. Naturally, the Michigan Chapter is probably the largest, and the Illinois chapter is big. It’s the highlights of great games between, let’s say, Ohio State-Illinois, Ohio State-Michigan, Ohio State-Michigan State. All those chapters. And the second book was called The Official Ohio State Football Encyclopedia, and that’s about a 700-page book. Jack: That actually goes into pretty good detail of every season of Ohio State football, up through 2000. Jack: It was published in the Fall of 2001. Jack: Well, Jim Tressel, of course, would lead Ohio State to the national title in two years, so the publisher had us come out with an updated version of that called The Official Ohio State Football Encyclopedia: National Championship Edition, so technically it’s another book because it’s got a different ISBN number on there. So that would be the third one. Jack: The fourth one is known as The Ohio State University Football Vault. It’s kind of a book for the eyes. Jack: It’s just of pullout memorabilia and so forth, and that came out in the year 2008, and Jim Tressel actually did the forward for that one, and Archie Griffin had done the forward to the first two. Kirk Herbstreit had done the introduction to the encyclopedia, and so forth. We felt very privileged that pretty high-profile people in the Ohio State football program lent their credibility to our books and everything. Peter: And you’ve got one coming out next year? Jack: Yes, yes. Maureen Zappala, who you know, is a very outstanding member of our Ohio Chapter of the National Speakers Association. She is a real, real excellent writer, and she’s also a huge football fan. She’s a Notre Dame fan, and she’s a Notre Dame graduate. She and I are collaborating on the book, which will probably be titled Buckeye Reflections. We’re not sure yet on the title, but that title kind of tells us what the book is. It’s going to be made up of short, anecdotal stories connected to the Ohio State football program: unusual things that have happened, outstanding things that have happened, humorous things have happened. Brothers that have played against each other in the Michigan game. Some of the stories will be very very short. There’s a game back in 1944 against the Great Lakes military base, that naval training base, where one brother threw a pass and his brother intercepted the play for the other team. The Cane brothers. Jack: Unusual and outstanding things like that. We’re going to have that. So we’re looking at the publication date of August 2017, and we’re having a lot of fun working on it. Peter: I know we’ve talked a lot about your travels, and going to the Hall of Fame and and just gathering up all this information, this unique information, and I know you and Maureen had a really good time putting this book together, and I’m excited for you because i’m looking forward to reading it when you’re all said and done with it. Jack: We’re the stories of things that maybe people were not aware of. The first female drum major in United State marching band history you know, Shelly Graph, where we were interviewing Shelly. We have a little story on what it was like to become the first female drum major there. Some usher stories that are really funny, the ushers get into all kinds of situations. Of course a lot of players have Woody Hayes stories that we’re using, but a lot of the fan’s stories – the cheerleaders and things like that. Real quick when Peter, this is a very short story, but I say it was just a bad day for Indiana all the way around. In 1932, Indiana is playing in Columbus, and so the they decide to bring their marching band to Columbus for the game. They board that marching band in buses in Bloomington, Indiana about five o’clock that morning, and as the buses take off for Columbus, and they put all the instruments in a truck. Well on the way to Ohio Stadium, the truck got lost some way, and the truck did not show up at Ohio State until the end of the third quarter. Jack: So the Indiana band was forced to play it’s halftime performance halftime show after the game, plus Ohio State beat Indiana at the end of that day 20 to nothing. Jack: So we just say that’s a short little story that was just a bad day all the way around for Indiana, in 1932. Peter: [laughs] That is a bad day. That’s a great story. Jack, I could sit here and talk to you for hours, and we will have another conversation again, especially around the time that your book comes out. Peter: I’ve been ending my podcast with a 10-question rapid-fire. You have no idea what I’m gonna ask, so we’ll see if we can learn just a little bit more about Jack Park. Peter: My first one is: Urban Meyer or Woody Hayes? Peter. That was easy. What’s your favorite movie? Jack: I don’t go to very many movies. Probably Marshall would be my favorite movie. That came out about five six years ago, about Marshall football team. I’m told that movie was very accurate too. Peter: Okay, I haven’t seen it but I will see it. Pittsburgh pirates or Cincinnati Reds? Peter: I knew you were going to do that. Jack: The greatest athlete I ever saw was Roberto Clemente. Peter: I love Roberto, and Willie Stargell in that group, but I grew up a big, staunch Reds fan. Peter: I have a ball signed by everybody from the Red’s team from 1972. Jack: Yeah, yeah. Well, as a kid growing up I followed the Reds somewhere in there, but hey, when I was at Pitt going through graduate school, the Pirates played at Forbes Field. You could look out the Graduate School of Business windows on the 19th and 20th floor. Peter: [laughs] What’s your favorite restaurant to go to? Jack: You know, probably Ruth’s Chris Steakhouse. I don’t go there a lot, because it’s pretty high-end and there, but you know maybe a couple times a year I like a really, really good steak, so maybe a couple of us or go out there. Locally here in Columbus, you know I don’t do much cooking so I eat out maybe one or two nights a week, and I kind of like the Rusty Bucket. Jack: They have a good menu for a spur-of-the-moment going in, and getting a decent meal and so forth there. So, I like the Rusty Bucket. Peter: I like the Bucket as well. What’s your favorite city to visit? Peter: [laughs] I just got back from Chicago. Jack: Yeah I know you did. I like going to Chicago. I just love walking on michigan avenue and so forth there, taking in some sporting events there. I’d have to say Pittsburgh would be a very close second. In Pittsburgh, for some people it may still have that image of a smoky city going way back to steel days, and course they’ve erased at many many years ago. Jack: I would say to people, if you’ve never been the Pittsburgh and you go to Pittsburgh and you have the opportunity, go up on Mount Washington overlooking the city, and you’ll see where the two rivers come together, the Allegheny and Monongahela, meet to form the Ohio River, at what is known as The Golden Triangle. It’s one the most beautiful views I think of any place I’ve ever been, so I like Pittsburgh. Peter: I haven’t been to Pittsburgh in a long time, and I recently was speaking in Pittsburgh, and I remember going through the tunnel, and when the city opened up I was in awe, and I was so much in awe I almost got into a wreck. Peter: [laughs] Right, and you know the next day and still see something that you’ve never seen. Packers or Browns? Peter: And if my memory serves me correctly, you’re a season ticket holder. Jack: Then you get the second home game and the fifth home game. You know in the NFL there’s a 16-game schedule, so you play eight games at home and eight on the road, and whatever the second game is and whatever the fifth game is, you get those games. So I can’t go up for all the games, and some years I don’t get to go up at all because the Packers might be kicking off at noon on Sunday, and Ohio State’s playing over here at 3:30 the Saturday before that. Jack: So we could fly to Chicago the morning of the game if it’s a night game, and then drive to Green Bay and see the game, and you better get your hotel reservation far in advance, and then the next morning you drive back to Chicago and O’hare and fly back home and everything. So it’s a busy two days and everything, but I would say to people, if you are a football fan, and if you’ve never seen a game at Lambeau Field and have the opportunity to do that, definitely take that opportunity, because it’s a wonderful, wonderful place to see a football game. Peter: and I have seen pictures of you in an empty Lambeau stadium before. Jack: Yes yes yes. I’ve done a lot of research up there on the on Vince Lombardi. I think one of the pictures you’ve seen is the Ice Bowl game. Jack: Which was played on New Year’s Eve Day in 1967. It was 10 below zero when the game started, and I guess it was around 15 below zero when it ended. Probably the most famous play in Green Bay Packer history: the packers are down by a score of 13 to 10, and Bart Starr, with 13 seconds to go, will go across then behind a block by Jerry Kramer will score on a 1-yard quarterback sneak on fourth down to win that game over Tom Landry’s Cowboys, and put the Packers basically in Super Bowl number two. I’ve had my picture taken where I’m told is exactly the place there in that south end zone where Bart Starr, way back in 1967, scored that touchdown in about 15 degrees below zero weather by the end of the game. Peter: [laughs] That’s great! What’s your favorite quote? Jack: I’ll have to think about that. Basically, I don’t know if this would be a quotation, I guess maybe my favorite principle that I’ve tried to live by, particularly in later years, is coach Hayes’ “Pay It Forward.” You get to a certain stage in life where you know, you’ve got fewer years left than you already lived. Jack: And you’ve got to be paying forward to the next generation, and look back and appreciate basically everybody who has gotten you to the place where you are. John Maxwell has a quote, and I I’m gonna paraphrase this, I maybe don’t have it exactly right: People basically believe in the leader before they will believe in the leader’s vision. Peter: That’s a good quote. Jack: That is, you have to buy into the leader right as a person, basically as a person of character, before you will buy into his or her vision of the future. In other words, what John Maxwell is saying is, if I can’t buy into somebody as a person, there’s maybe something about their character or something about them but I don’t really care for, it would be very hard for me to buy into where they want to lead us. Jack: But if I buy into that person as a person and then as a leader, I’m much more apt to be able to follow them, and probably the organization as a result will get much more accomplished then, yeah. Peter: And we see a lot of that in today’s leaders. If you think about coaching, and that quote that you just gave us made me think of Chip Kelly, because he lost that locker room. Jack: It doesn’t matter how great the players were, right, it doesn’t matter. Peter: Yeah. Microsoft Excel or a legal pad and calculator? Peter: That one surprised me. Bear Bryant or Nick Saban? Peter: I kinda figured that. Peter: And the last one: July 17, 1937. What day was that? July 17, 1937. Peter: He’s not Googling this, I’m watching. Jack: Let’s see… it was a Saturday. Peter: It was a Saturday. So, I just Googled July 17, 1937, and that day was a Saturday. Your photographic memory just astounds me. Peter: That you can do that without looking at or surfing or doing anything. You just went through the calendars, and it’s a Saturday. Jack: Peter, I don’t know. I really don’t know how I do that, except I can see those calendars. Now 1937 took me a lot longer than it would be if it was 1987 or something like that. Jack: I relate some of it to the football dates, and I’m not sure how it all works, I just kind of see those pages some way, and I miss it from time. But 1937, yeah I thought was a Saturday after I worked that back. Peter: And you were right. Jack: Okay, great. Happy birthday, your mom’s birthday will be coming up here. Peter: Hahaha, yeah, Jack like you said, thank you so very much. I enjoyed this, I know the audience is going to enjoy this. I love listening to your stories, I love hearing you speak, and I look forward to the next time. Jack: I appreciate our relationship very much. We’ve become very, very good friends over the years. I appreciate being your guest, and I want to wish you much, much continued success Peter.